Just In: Dino Melaye defects from APC to PDP – Royal Times of Nigeria. 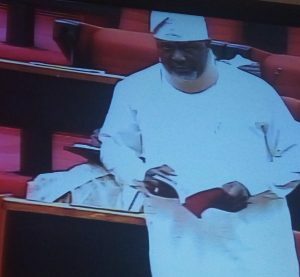 Embattled Senator Dino Melaye on Wednesday made a surprising appearance at the Senate, declaring his intention to cross over to the PDP Senate wing of the chamber. It could be recalled that Melaye had been away from the Senate, since over a month, when the Nigerian Police arrested him and he was subsequently admitted at the intensive care unit of the National Hospital, Abuja.